Fairbanks Natural Gas (FNG) knows what it takes to move natural gas. The company, an Alaska-based utility, provides natural gas to over 1,000 residential and business customers in Fairbanks Alaska. In order to offer natural gas to its patrons, FNG’s sister company, Titan Alaska LNG, transports liquefied natural gas (LNG) by way of truck and trailer after condensing and storing it at its plant in Big Lake Alaska. Part of Titan’s fleet includes Kenworth T800 trucks powered with Westport’s 15 L HPDI engine. Titan owns these units, however leases them to a third-party transport provider. Fairbanks Natural Gas and its sister company, Titan Alaska LNG, use natural gas-powered Kenworth T800 trucks to transport LNG from Big Lake to Fairbanks, Alaska. After the LNG is shipped from Big Lake, the LNG is temporarily stored in large vessels until natural gas is needed by FNG customers in Fairbanks. 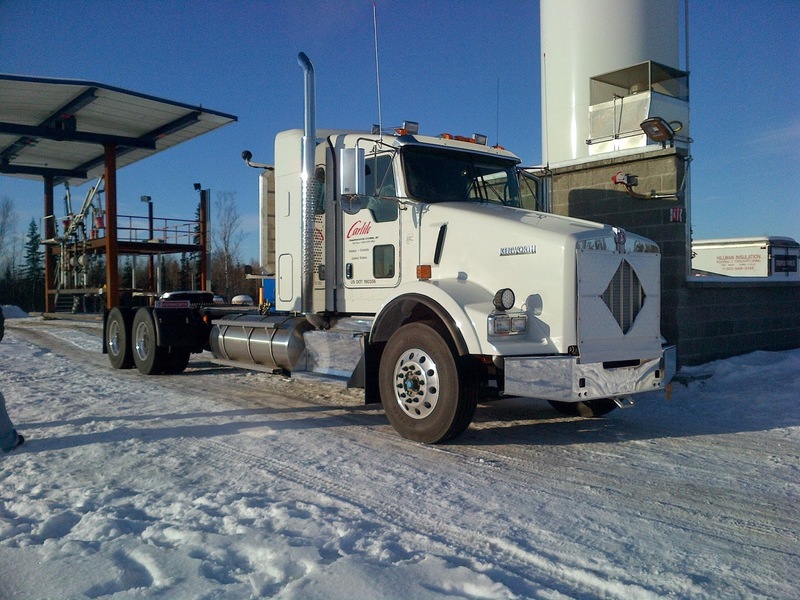 When outside temperatures dip, the LNG is heated and converted back to compressed natural gas. The gas is then odorized for easy detection in case of accidental release and sent into the underground distribution system. The gas moves through the underground system to homes and businesses throughout the community. Titan completes about six deliveries a day from Big Lake to Fairbanks – each trip is around 700 miles (over 1000 kms). Each delivery contains about 9,500 gallons of LNG or 800,000 cubic feet of gas – enough to heat 30 average Fairbanks homes in the coldest winter months. Annually, Titan delivers about 10,000,000 gallons of LNG to local customers. Before FNG began trucking LNG, natural gas had been unavailable to the Fairbanks area. Dan says the company built two fueling stations through a company it owns called Artic Energy Transportation, to fuel its fleet of both heavy haul and light duty natural-gas powered trucks. The stations are currently for private use, but in the future may be opened to the public if there’s sufficient demand. “So far we’ve been pleased – the trucks have been operating as expected,” Dan says of his fleet, which endure an arctic environment of hilly terrain and temperature ranges from +90F (32C) in the summer to -50F (-45C) in the winter, carrying a gross capacity weight of 85,000 to 107,000 lbs. Dan says he was comfortable making the transition to a natural gas fleet having previously worked in British Columbia’s natural gas utility industry. “I’ve been watching LNG trucks for a long time,” Dan says.